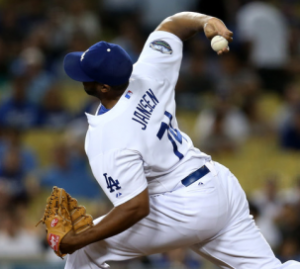 Dodgers might not use Kenley Jansen as their closer when he returns from the DL. Kenley Jansen begins his rehab assignment tonight for Single-A Rancho Cucamonga. He’s expected to pitch the first inning, then come out of the game. If all goes well, he’ll start again for the Quakes on Sunday. The rehab assignment is expected to span “at least 5 or 6” appearances, according to Dodgers manager Don Mattingly. In theory, then, Jansen might rejoin the Dodgers on May 11, when they return home from next week’s road trip through Milwaukee and Denver. Jansen has been the Dodgers’ closer for all or part of the last three seasons. Naturally, he’d be the Dodgers’ closer again when he returns, right? Not necessarily, Mattingly said Friday. To interpret: Juan Nicasio usually pitches with the Dodgers are trailing on the scoreboard (the “BHD” column). Pedro Baez, Yimi Garcia, Paco Rodriguez and J.P. Howell frequently pitch when the Dodgers are ahead (the “AHD” column) and in high-leverage situations (as measured by “ALI”). Joel Peralta has gotten the most save opportunities (SVOPP) and saves (SV) but is currently on the disabled list. If Jansen does get all the save opportunities once he returns, something will change for a Dodgers team that has spread its save opportunities around. If Jansen doesn’t get all the save opportunities once he returns, something will be changing for him. That’s the role he’s used to. This entry was posted in JP on the Dodgers and tagged Kenley Jansen, Yimi Garcia by J.P. Hoornstra. Bookmark the permalink.